The indestructible drying towel that dries anything FASTER and EASIER! Everything you’ve ever heard about the amazing Absorber drying towel is 100% true! The Absorber drying towel holds 50% more water than a natural chamois while being resistant to most chemicals – including grease and oil! The Absorber drying towel drinks liquids like it’s going out of style! The Absorber XL is the extra large version of this amazing towel, and it’s the one you’ll find exclusively on our website in two colors – BLUE and NATURAL. The Absorber XL is a synthetic towel that earns its name from the amazing amount of fluid that it soaks up. The Absorber XL is a massive 29 x 18 inches, making it large enough to dry boats and RVs with ease. Use the Absorber XL anywhere you’d use a sponge, towel or chamois. Keep an Absorber XL on your boat at all times and soak up spills in a snap! Get an extra one to use in the kitchen to prevent an accidental spill from turning into a catastrophe! The Absorber XL is resistant to most chemicals, and cleaning the towel is as simple as tossing it into the washing machine. The Absorber XL is tough, lintless, and can be washed and reused over and over again. 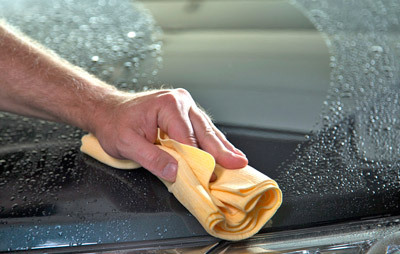 Use the Absorber XL to safely dry your car, boat or RV. Conveniently sized at 29 x 18 inches, the Absorber XL is easy to hold on to, even for those with small hands. Best of all, the Absorber XL will not scratch black paint!